SAN DIEGO — San Diego Bay’s 12th annual Big Bay Boom fireworks show was supposed to be louder and more intense than any in years’ past, but turning the entire show into one giant 15-second pyrotechnic finale was not in the plans. However, as fate would have it, that’s exactly what happened. 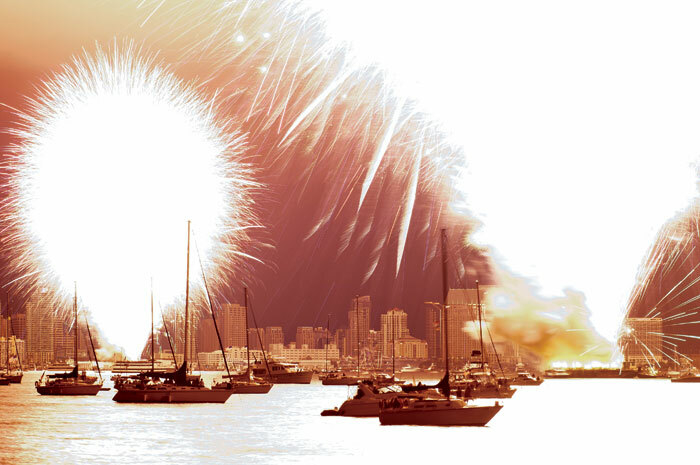 According to the show’s producer, a case of computer troubles doomed the five separate locations where the fireworks were set to go off, signaling the four barges in San Diego Bay and the Imperial Beach Pier site to launch all of their fireworks at the same time — leading to a bright, deafening and confusing 15 seconds before ending abruptly. The show was scheduled to begin at 9 p.m. July 4, but a test signal sent out to all of the locations four minutes prior to the show prematurely launched all of the fireworks at once, setting off 1,656 shells and 2,500 “multiple barrage” shots from each location. Instead of a carefully orchestrated and synchronized show stretching across the bay, choreographed to patriotic music on a local radio station, show participants got an earful. After the initial shock and scattered applause, boaters on the water and hundreds of thousands of onlookers on shore realized the show was over before it was even scheduled to start, leaving many viewers disappointed and confused. No injuries were reported during the show, and both the Coast Guard and San Diego Fire Department were tasked with getting the word out to the public that the show had malfunctioned and the scheduled 18-minute show had been downsized. The show’s title sponsor, the Port of San Diego, show producer H.P. Purdon and Co. and pyrotechnics group Garden State Fireworks all issued apologies for the malfunction, with Garden State Fireworks promising to either pay for an additional show or to cover the cost of next year’s Fourth of July fireworks show. According to Garden State Fireworks, the simultaneous ignition was not due to any “sabotage,” hacking or massive computer hardware failure. Instead, the fireworks display sequence started when it was expected to, but the computer ran a double file created in the back-up plan download process, causing the immediate ignition sequence. While the New Jersey-based pyrotechnics company has promised to cover the fireworks of an upcoming show, show producer president Sandy Purdon said the actual fireworks display is only a portion of the total cost of the Big Bay Boom. Other expenses include barges, tugs, buses, promotions, advertising, permit fees, environmental costs and more. Purdon estimates the fireworks portion to cost around $125,000 with the remainder of the show costing around $330,000. He said the show’s sponsors — including the Port of San Diego, San Diego County and supporting restaurants, businesses and individuals — would have to cover the remainder of the cost for an extra show. This year, the port contributed $145,000 for the Big Bay Boom. “Bright and loud,” according to many onlookers.